Starting on November 23, players of Wargaming’s popular naval combat game, World of Warships; will see massive 30-50% discounts on premium ships, port slots, and consumables. Along with the fantastic ship and consumables sale, costs for training ship crews will be reduced; making it easier to equip your new ships with more skilled crews! Players of World of Warships will want to grab these deals, as they “sail away” on November 30. 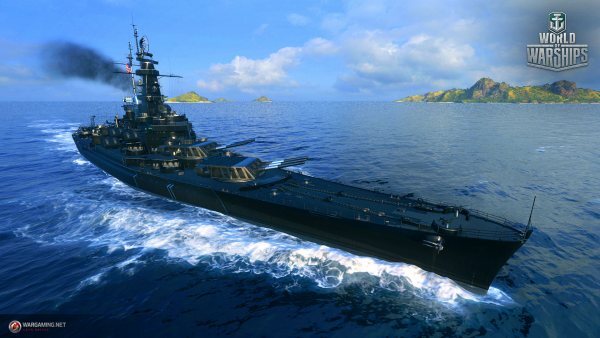 To help players make the most of their new purchases, World of Warships will launch a special series of in-game Combat Missions, where participants can earn Black Friday prize containers. These containers hold bonuses such as all-black camo patterns for ships, extra days of Premium playtime for earning XP and currency faster, premium ships, and more! On November 21, Wargaming will release Update 0.7.11 for World of Warships, bringing with it a variety of fixes and changes. Some of the biggest changes include damage model updates which are especially helpful for Destroyer captains — who will find their ships buffed to be more durable in battle, along with multiple changes to maps to aid in manoeuvrability and lines of sight. The in-game Halloween event continues through Black Friday weekend; with the addition of PvP, allowing players to do battle on spook-tactular battlefields. What’s more, the Royal Navy event remains ongoing; meaning players will find additional British ships, camos, and more in Update 0.7.11. Fans of historical British destroyers should definitely check out this new update, as it contains several ships they’ll want to add to their home ports. The Arsenal gets a refresh, removing the Royal Navy category; but adds the French Tier X battleship, “Bourgogne.” This steel behemoth is sure to make an impression on all who encounter it!